Dave Lee doesn’t play Dean Martin, Dave is Dean Martin! Ask him if he wants a drink and he will give you his standard reply – “The last time I said no, I didn’t understand the question!” Instantly likeable and full of fun, Dave fills the larger-than-life Dean role effortlessly. He’s also has the ability to get everyone around him to join in, which is why Frank (Martin) calls him “Behelzebub”. And the voice? Just listen to a couple of bars from those smooth Latino pipes and you won’t need any more convincing! Dave Lee, professional singer and musician spent most of his time working in the clubs and concert halls during the 60’s and 70’s with famous bands such as The Mersey Beats, The Rockin’ Berries and as lead vocalist with the Sid Lawrence Orchestra in the late 70’s when he appeared on the Royal Command Performance at the London Palladium. During his time in the British cabaret circuit, Dave was a regular vocalist with the B.B.C. Performing on all the late night shows with the big bands who were featured on shows such as “Music through midnight“, “The Late show” and many more. He later spent more tham 20 years in Dubai where he owned two world famous restaurants – Pancho Villa’s and The Alamo, which have featured in Time Magazine and Newsweek. Six years ago Dave returned to Europe to concentrate on the thing he loves most – singing. 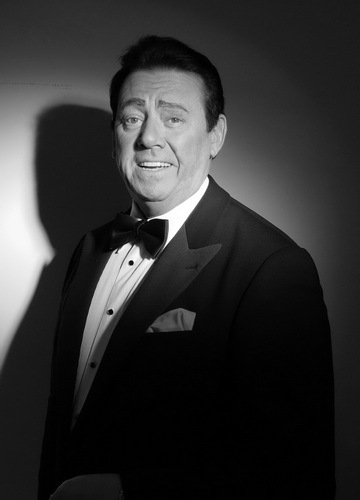 He inmediately took the role of Dean Martin in the highly successful “The Rat Pack – Kings of Swing” and the world famous Benidorm Palace Theatre in Benidorm.